Mark your calendar now to visit the fall women’s expos. The fourth annual Lebanon County women’s expo will be held at the Lebanon Expo Center on Oct. 1, from 9 a.m. until 2 p.m., and the Cumberland County women’s expo will be held at the Carlisle Expo Center on Nov. 12, from 9 a.m. until 2 p.m. Don’t forget that you need a little time to escape, indulge, relax, and explore. OLP Events presents four women’s expos a year and I love “working” at all of them. It’s so much fun to talk with not only the exhibitors, but also the women who attend the events. They’re always so happy having a day with friends or family. The aisles at the women’s expos will be lined with businesses that want to greet you! And many of them will be offering products that will make great holiday gifts. I often find unusual items to give as presents, but I also always seem to find things that say, “Buy me, buy me,” and I can’t resist. From foods, purses, and household items to jewelry, body care products, and personal security items, you’ll be pleased to find them all the expo! Many local businesses from the area will also be offering products and services that touch just about every facet of a woman’s life—health and wellness, nutrition, fitness, travel, home improvements, finances, entertainment, and more—and they will be eager to meet you. 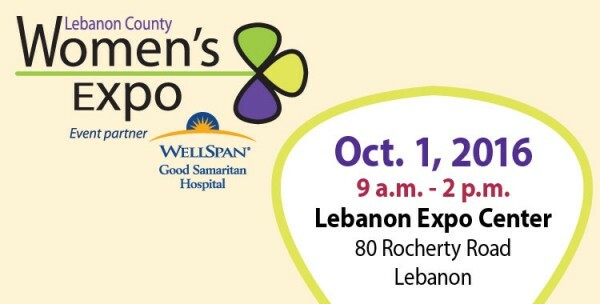 We are fortunate to not only have WellSpan Good Samaritan Hospital as our partner for the Lebanon County women’s expo, but they are also your partner for health! Stop by and talk with them about all of the services they now offer to the community, including their state-of-the-art cancer center. A couple of highlights of the women’s expo include the always popular fashion show, courtesy of Christopher & Banks Outlet at Rockvale Outlets, at noon on the stage; a soap-making demonstration by Gina Napoli (you just might be able to make some of your gifts this year); and health and wellness seminars by WellSpan Good Samaritan Hospital. Check the website for more information about entertainment and demonstrations! Sponsors of the event include FM 90.3 WJTL, HOT 93.5, NASH 106.7, Natural Awakenings, WDAC, WHTM abc27, and WINK 104. Enjoy some time with other women at the women’s expo. It’s a great way to spend your day. Log on at www.aGreatWayToSpendMyDay.com for free advance guest registration ($5 at the door) or for more information.